Since the dawn of transplantation organs have been retrieved from patients immediately after circulatory arrest, specifically from “non-heart-beating” donors. When the Harvard Medical Committee in 1968 defined the concept and the diagnostic criteria of brain-death, organ retrieval began to be performed in patients whose death was ascertained after brainstem testing. These “heart-beating” donors have become the main source of organs for transplantation. However, the number of heart-beating donors is now declining because fewer young people are dying from severe head trauma or catastrophic cerebrovascular events and the diagnosis and management of brain injuries have improved. 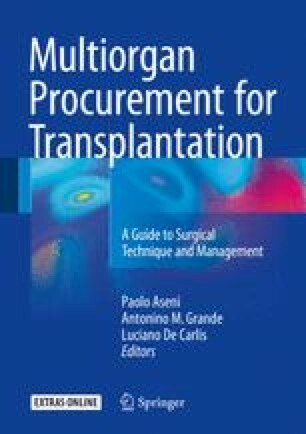 Therefore, the scarcity of donor organs is the primary limiting factor of transplantation worldwide, and this condition causes an increased time span between listing and transplantation and prevents the death rate on the waiting list from improving. For this reason, selection criteria for organ donors have changed, and grafts from “marginal donors” have been used. These are older than optimal donors or present mild to moderate grade of organ dysfunction (such as diabetes mellitus, hypertension, renal insufficiency) or may transmit infectious diseases (CMV or HCV hepatitis). However, “marginal donors” do not affect outcomes in selected cases. Finally, the constantly increasing gap between donors and patients on waiting lists has prompted donation after circulatory death (DCD) or “non-heart-beating donors” (NHBDs). ECMO has been increasingly used in patients with acute cardiac failure and in patients after cardiac arrest, both in and out of the hospital. Mechanical circulatory support with ECMO may prevent loss of organs through haemodynamic stabilization of donor. DCD donors are usually identified according to Maastricht classification based on the circumstances of death and, consequently, the warm ischemic time. ECMO techniques must be further studied to ameliorate graft survival and transplantation outcome.